As a reader of our website and publications, you know we make it our business to regularly honor the exceptional work of Minnesota attorneys. In fact, it’s part of our mission. Whether it’s our Attorneys of the Year, Up & Coming Attorneys and Unsung Legal Heroes or Diversity & Inclusion, we recognize scores of deserving honorees each year. Now we have a new recognition program, with a slight twist on our traditional concept. 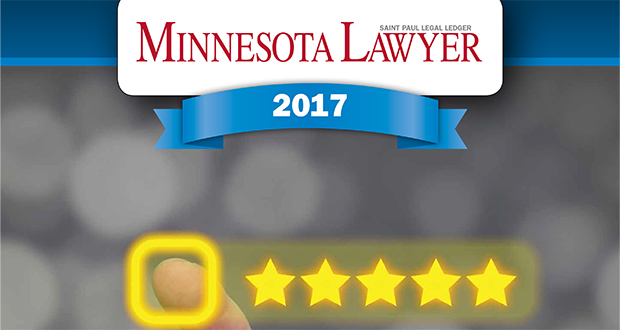 Welcome to the 2017 Reader Rankings for Minnesota Lawyer. We believe it complements our suite of awards. But instead of recognizing individuals, these awards recognize businesses and organizations that support you each day. And who better to decide the top businesses by each category than you – our readers who have the experience. Whether it’s forensic accounting or malpractice insurance, you know who does it the best. All we did was calculate the results. You’re a discriminating lot, so to receive this honor is something these businesses will want to brag about for quite a while. And they should. The top companies represented in each of the categories help you in your work across the spectrum of your lawyering. Some have been around for many years, offering stellar services. Some are new on the scene but already showing you great promise. 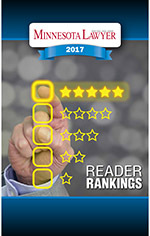 We thank you for your support in making the decisions on the winners of the 2017 Reader Rankings. And, no doubt, the businesses you selected in the top spots appreciate your support every day.